Is Ohio Trying to Sneak a Highway Through Cincinnati? This promotional video from the lobbyists at the “National I-73/I-74/I-75 Association” pitches the idea of a highway running through the Cincinnati area all the way to Myrtle Beach, South Carolina. The extension of Interstate 74 through Cincinnati is one of those zombie highway plans that never quite seem to die. In the 1990s, the road was envisioned as a toll highway, connecting to Interstate 73 and linking the Midwest to the Carolinas. And West Virginia has been taking steps to prepare the necessary roads, piece by piece. In Ohio, talk of an interstate highway though Cincinnati, as the project would require, has been mostly quiet since the 1990s. Instead, the state of Ohio has been focusing on a close approximation it calls the Eastern Corridor, a project that is moving forward despite fierce opposition from residents of the affected areas. Speaking on terms of anonymity, a source claims that he was approached in the mid-1990s by Hamilton County officials and out-of-state toll road builders who sought to extend I-74 from its current terminus in Cincinnati at I-75 to SR 32 in Clermont County. 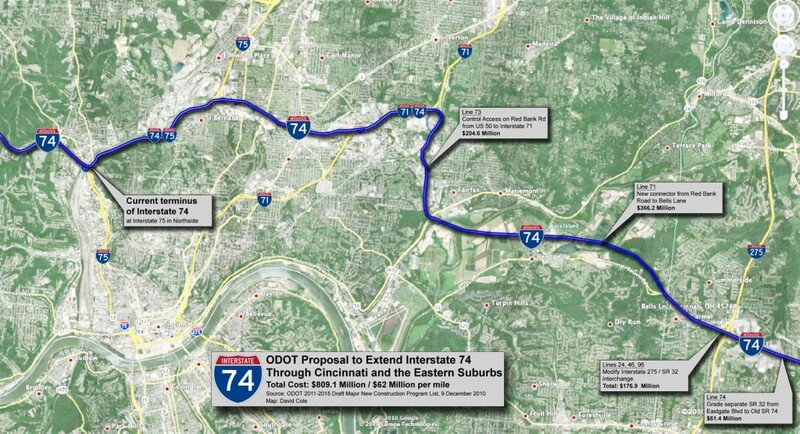 According to the individual, the Eastern Corridor Program charts a different route for I-74 across Hamilton County but it achieves a similar end. Specifically, it aims to open eastern Hamilton County and Clermont County to development in a way that interstate-quality upgrades to SR 32 east of I-275 could not alone achieve. Near Cincinnati, improvements to SR 32 are bringing the roadway closer to Interstate Highway design specifications. A new $32 million interchange is under construction at I-275, and the Clermont County Transportation Improvement District is studying full grade separation and controlled access from Batavia to the Brown County Line. Within Hamilton County, ODOT divided a possible I-74 route into two separate projects: SR 32 Relocation and Red Bank Road upgrades. At an August 2011 public meeting, ODOT displayed drawings of Red Bank Road reconstructed as a fully grade separated and access controlled expressway. Those drawings do not currently appear on the project’s website. Elsewhere on the Network today: Systemic Failure says Fort Lee, New Jersey, is guilty of a pretty heinous traffic sin of its own. Seattle Transit Blog reports that the state of Washington’s Department of Transportation can’t seem to say no to highway megaprojects, even as its budget situation becomes dire. And City Block explores the particulars of integrating retail space into transit stations.